Cap welding machine is mainly useful for Blow/Fill/Seal machines to produce a multi-entry insert format for LVPs. A large variety of injection molded after-market caps can be used also with this system. 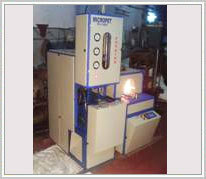 The cap welding machine is manufactured by Weiler Engineering. So as to accomplish high level of customer trust, we are keenly involved in offering Blow Fill Seal Machine. We offer them at reasonable rates.